The Palestinian President, Mahmoud Abbas, will submit a bid for Palestinian statehood to the UN Security Council this week. The US will veto this application. The US has been working diplomatically to prevent Abbas' move. The US claims that "unilateral" actions are unhelpful though somehow it never seems to get too upset about unilateral Israeli actions. Abbas has a fallback option of submitting an application for UN observer membership (similar to the Vatican) to the UN General Assembly. This can't be vetoed. 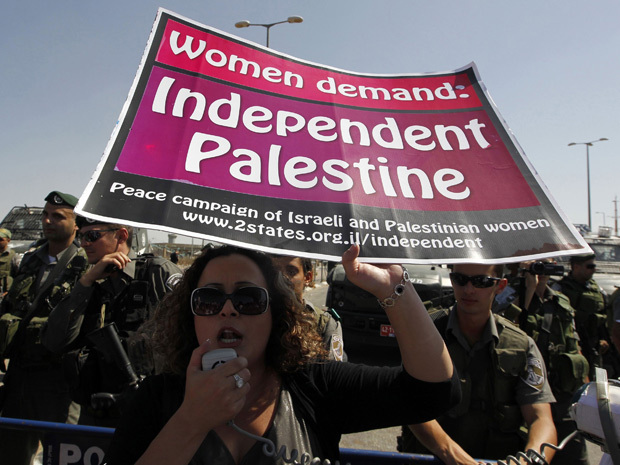 Either way, a Palestinian state would have greater access to international treaties, organizations and courts. This worries Israel. The US and its allies have tried to persuade some UN states to vote against the application, though it is conceded that a General Assembly vote offers the Palestinians a better chance of success. In either case, the Palestinians do not have the military strength to evict the Israeli Army and Israeli settlers from a Palestinian state. The Palestinians lack the latest and greatest in land mines, fuel air bombs, automatic shotguns, cluster bombs, small arms, helicopter gunships, jet fighters, armored personnel carriers, self-propelled artillery, tear gas, bulldozers, tanks, mortars, depleted uranium munitions, unmanned drones, motion detectors, sniper rifles and other weapons which Israel either lovingly obtains from the US or produces on its own. On cue, several US elected representatives or Presidential candidates have started to agitate to cut off aid to any Palestinian state and/or to the UN. As some Western commentators or politicians have cynically pointed out, any declaration of statehood-whether it is a formal UN Security Council resolution or the lesser General Assembly version will not change anything for the Palestinians. Israel is not ending the occupation so why bother going thru with it? One could just as easily ask the people who say this, if you aren't worried about an independent Palestine, why are you so desperately trying to prevent Abbas from making good his promise to submit the application? The answer is pride and arrogance on the one hand, desperation on the other. The US doesn't wish to be embarrassed by vetoing the Palestinian drive for independence at the same time it is mouthing pieties about the Arab Spring. It just wants the Palestinians to bleed peacefully and hopefully fade away into irrelevance. Israel doesn't want to admit to what exactly it's been doing in the occupied territories-which is why the state and its supporters diligently work to prevent any information from getting out. Apparently, the Palestinian Authority has finally realized that Israel has absolutely no intention of ending the military occupation. NONE. As the Wikileaks documents made clear not only does Israel not wish to end the occupation, its concept of a Palestinian state is at most a "state" which cedes control over its airspace, radio frequencies, immigration policies, boundaries and water rights to Israel, is disarmed, and allows Israeli troops to enter at any time to arrest or kill "terrorists"-in other words, no state at all. When you are dealing with someone who is so confident in their total control and superiority over you that they see no need to even throw you a face-saving crumb, at some point you will do something, ANYTHING, to make the point that you're here, you matter, you're human and you intend to resist. The negotiations have dragged on, halted, restarted and are currently stopped. But one thing that has been a constant in the West Bank and East Jerusalem is the establishment of new Israeli settlements and the growth of existing ones. There are over 500,000 Israeli settlers in the West Bank, roughly triple the number that was there when the "peace process" started. 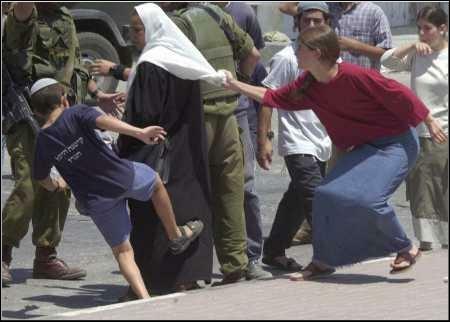 Israelis "negotiating" with a Palestinian woman. It is difficult to overstate how humiliating this is to the Palestinians and how corrosive it is to negotiation. If we intend to share a pizza and I continuously take more slices from your portion while mumbling through mouthfuls that "We need to continue the negotiations", eventually you will stop the "negotiations". You will attempt to either physically prevent me from eating the rest of your food or find someone who can. Otherwise there will be nothing left to share. Actions speak louder than words. The US is the only state which could make Israel do something it doesn't want to do, which is why some Palestinians were actually happy to see President Obama elected. They believed that perhaps there was finally a US President who could be a fair broker. These people soon learned that that wasn't the case. The settlements are illegal under both the Geneva Conventions and previous UN resolutions. The Palestinians sought a new UN Security resolution stating this. The US vetoed it. When President Obama said that the settlements needed to stop, Prime Minister Netanyahu gave him the finger and said settlements would continue. President Obama backed down. When Vice-President Biden visited Israel the Israelis took the opportunity to announce new settlements. President Obama backed down. When President Obama mentioned that the 1967 border needed to be the basis of negotiations, Prime Minister Netanyahu threw a temper tantrum and stated that there would be no going back to 1967 lines under any circumstances. Just so no one would misunderstand he publicly lectured President Obama on this and proceeded to share his opinion with the US Congress. President Obama backed down. A blind man can see that here the tail is wagging the dog. As even pro-Israel NYT columnist Thomas Friedman belatedly and ruefully admits, there is a very strong US pro-Israel lobby that plays hardball against anyone who doesn't obsequiously prostrate themselves before the throne of reactionary Israeli stances. 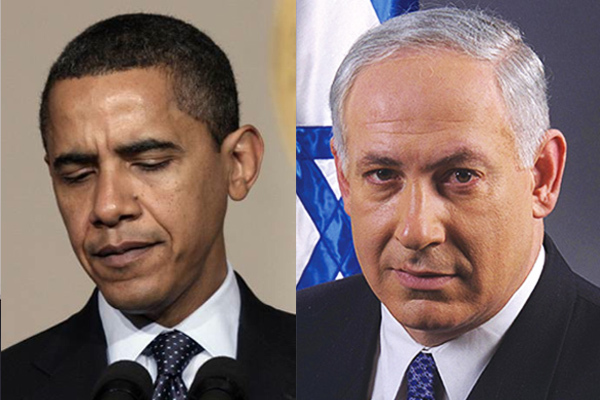 As he puts it "..This has also left the U.S. government fed up with Israel’s leadership but a hostage to its ineptitude, because the powerful pro-Israel lobby in an election season can force the administration to defend Israel at the U.N."
Obama and Abbas will meet today. 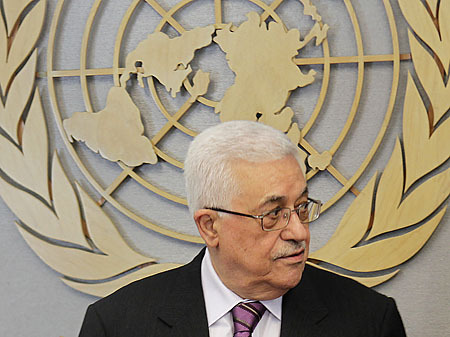 The US wants Abbas to back down for some vague promise to restart negotiations. He may well do that. He doesn't strike me as the bravest man. But as one man once said "There comes a time when the cup of endurance runs over, and men are no longer willing to be plunged into the abyss of despair." We will see if Abbas is ready to stand up and be counted. 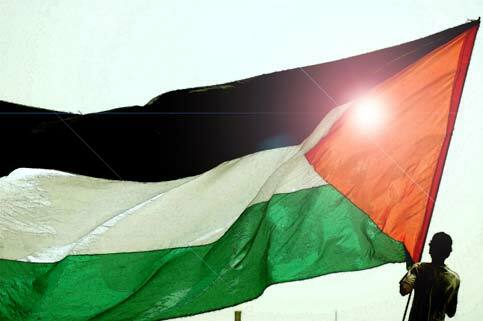 Ironically Hamas and some other Palestinian activists and intellectuals oppose Abbas' gambit, decrying it as futile and as ceding rights to land inside pre-1967 Israel. In this view Abbas is implicitly (and perhaps explicitly?) recognizing Jewish hegemony in Israel. Politically Abbas is under pressure to show Hamas and the Palestinian people that he can actually win something. 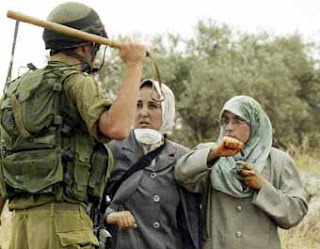 I think that the settlements are so thoroughly embedded in the West Bank that the Palestinians would be smarter to agitate for equal rights in a unitary state-a la South Africa. If Apartheid South Africa can change then so can Israel. I don't think a West Bank state is viable. But then again I don't have to worry about not being allowed to drive on a road in my own neighborhood. I'm not surrounded by military checkpoints and humiliated for fun by bored soldiers. I'm not being used as a test subject for new crowd control technologies. There are no crazed armed-to-the-teeth settlers defacing my place of worship, shooting my children, or tearing down my olive trees out of pure malice. I haven't gone to a demonstration and been shot at with live ammo. I haven't had my legs broken for throwing rocks. I haven't visited a theater and had it raided by the Israeli Army. I don't have execution squads looking for my brother and killing my father by "mistake". So it's easy to pontificate from over here what the Palestinians should do. Like anyone else they're probably trying to do the best they can. Will Abbas defy the US and submit a UN application? If he does this what will this mean for the Palestinians? Is a US veto the right move?